INDIAN’S new Springfield is a classic hard-bagged tourer which can be easily stripped back to a heavyweight cruiser by simply popping off the screen and bags. 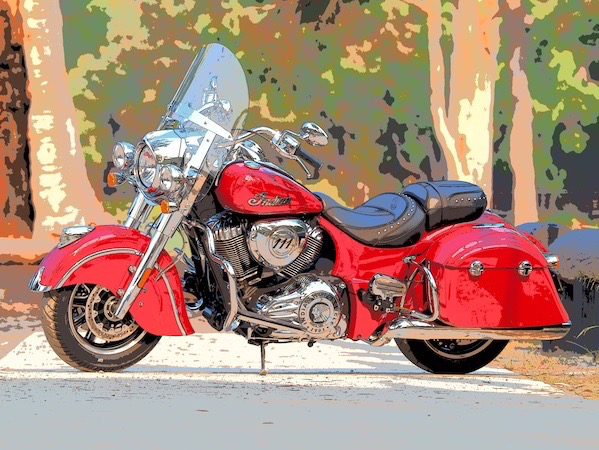 Until now you’ve only had the option of hard bags on the Chieftain or Roadmaster – which also come with big fairings – or the Vintage, which has soft bags. The Springfield offers naked, standard screen or optional tall and short screens, and you can also add a top box, so there is a plethora of screen and luggage options to make this bike one of the most versatile machines of its genre. Even the optional Top Box can be removed in seconds if you know how (and if you’re concerned about security, you can add security screws to make it take longer). No tools are required to remove the cases and screen, so the Springfield goes from fully dressed to naked in a few minutes. Springfield is also the name of the birthplace of Indian motorcycles, another pointer to the heritage of the brand. 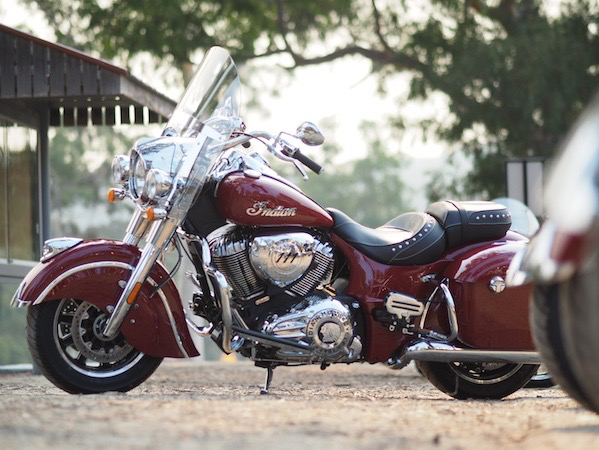 The style is very much modern Indian, with the same 111 Thunderstroke V-Twin engine powering all the big-bore Indians, the headlight nacelle, tank and seat design all familiar shapes. The Springfield’s closest relative is probably the Chieftain, although losing the big handlebar-mounted fairing has certainly trimmed off the kilos. That weight loss makes the Springfield feel a bit lighter in the turns, although it’s still a big, long and heavy bike – although thanks to the aluminium frame and decent suspension, it hides the kilos quite well, especially above walking pace. The geometry of the steering helps the Springfield roll into turns nicely, and the soft suspension provides a comfortable ride. Although closely related, the Springfield isn’t a Chieftain without the fairing though, there’s more to it than that, including different wheels and less trail, hence the faster steering, although it’s no Scout. 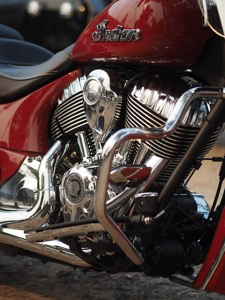 The Thunderstroke engine powering all the big-bore Indians is sublime – powerful and torquey with a relaxing vibe. At 111 cubic inches – around 1900cc – it’s a big motor, and that’s reflected in how hard you can ride an Indian off the traffic lights and up to highway speeds. The classic design, weight and big screen of the Springfield means it’s not a high-speed cruiser, but it’ll happily carry you long distances at illegal speeds if you give it enough of the ride-by-wire throttle. That’s not what it’s all about though, and not what the target market for the machine is looking for, either. Nope, the Springfield is aimed at experienced riders who love the American style, who will be carrying a pillion some, if not all, the time, who want performance to get around the traffic and have fun on a winding road, to slip past the caravans and trucks, to enjoy the ride. If you’re one of this people, get yourself a test ride. The full test of the Springfield is coming soon.